Homewood Band "40th Anniversary Macy's Day Parade"
Donations will help cover travel for our 2018 Macy's Day Trip! Donations are vital for the success of this program! Donations ensure we have every student in the Homewood Patriot Band attend the Macy's Thanksgiving Day Parade! Homewood High School Band family, friends and fans - Thank you so much for taking the time to view our fundraiser page. Your support will help us offer a higher quality experience for all of our young musicians. Your Donations are here to help the TRAVEL cost for these young students to get to New York City! Your donation is tax deductible and you will be getting a receipt for your gift. If you could please spread the word about our fundraiser by sharing it with your friends via Email, Facebook and Twitter, we would greatly appreciate it. Let's Go! -Pence! Cover 4 Payments of the Upcoming Trip! Will Help Cover Cost of Travel from 2 Students! Help Cover cost of Upgraded Equipment! "Wishing you a successful fundraiser." "My oldest brother Kevin marched in the parade as a Tuba, and I followed in his footsteps and marched in the parade as a Tuba in 2006. It was a great trip, and wonderful experience." "Best wishes! Enjoy New York!" "We love you, Claire Merkle! Go Patriots! Craig, Myra, & William Noble"
"Such an exciting opportunity to march in the Macy's Thanksgiving Parade next year. Congratulations Judson! love, Aunt Katie"
"Congratulations Janae! We are proud of you!" "We are so excited for you!" "We are proud of you Isa." "So proud of you Hannah! Can’t wait to watch you and the Homewood Band at the Macy’s Parade! Love Uncle Don and Aunt Linda"
"Proud of you Kate Gillum! Happy for Homewood Band having such a rewarding and exciting opportunity for all!" "Brie, We are so proud of you. The Macy Day Parade is in for a treat. Wishing you and the Homewood Band continued success. Uncle Will & Tee Tee Dondra"
"Trey Lemmon, you're the best!" "We love you, Brie! We hope that the Homewood Band reach its goal. ❤️ The Curtis Family"
"State Rep David FAULKNER is proud to support the Homewood Band!! " 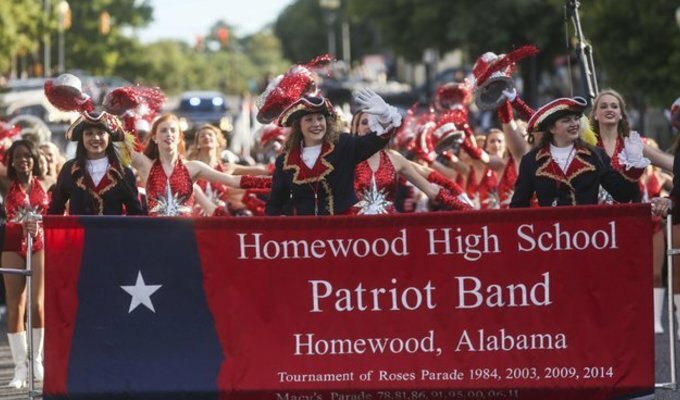 "State Rep David FAULKNER is proud to support the Homewood Band!" "State Rep David FAULKNER proudly supports the Homewood Band! " "What a way to end your senior year. We are so proud of you. " "So excited for you to march in the Macy's Day Parade next year, Judson! Love, Aunt Judy"
"Congrats, Breanna! So very proud of you!!!" "Glad to support such a gifted girl. Go Ella and the Homewood Patriots!!" "Have a wonderful time on your trip Ella!" "Have a great trip! Love you, Aunt Rosie"
"HAVE A WONDERFUL TRIP SHUG!! YOUR PAPA WOULD LOVE THIS!" "Congratulations on another great year; we are so proud of you!! Love Lili and OD"
"Enjoy your trip TJ! Love, Brandon and Beaonica"
"We Love You - BeBe & Pa"
"Congrats Ella! Keep up the good work. Happy to see you set your goals high and help you reach them XO"
"Good Luck Hannah Farrar!! From the MN McArthurs!" "Hope you have a great time!" "Richard, you are wonderful caring young man and I am glad to know you! Enjoy the parade!!" "Proud of you and grateful to know you. You are a remarkable and interesting young man. Enjoy the parade~"
"Have a Phenomenal Time Ella"
"We love you, Gabby! We are so proud of you and think you are AWESOME! Have fun!" "We love you, Lana! You are AWESOME and we are so PROUD of you. " "Avery, so happy that you will have this wonderful experience!" "I love you son! God luck!!!" "Have a great Macy's Day Trip"
"We are super proud of Eliza Angelo and all the Homewood Patriot Band Members! What an honor to play at the Macy's Day Parade! " "Go Homewood! Congrats and have a blast!" "We love you Ella! Wes and Sam"
"Marching in the Macys parade was a wonderful memory for me! Hope as special for JJ!" "Enjoy this great experience! I ❤NY. And I ❤U. Grandma Gloria. " "So excited for you, Mac! What an adventure!! Aunt Kym"
"Love you Clara Xoxo Auntie Krista "
"So happy to support Eleanore Yarbrough and the Homewood Band in the Macy's Parade! Let's go Homewood!" "So excited for you, Isabel!!! " "Love you Alden! Good luck"
"Wow! What an exciting opportunity for you Jackie Bald. I'll try to get to NYC to see the parade. Love marching bands!!" "A great investment in their future." "March on Ella! What fun!" "Hey sweet girl! Marco and I hope that you have an incredible experience at the Macy's parade. You only get to do this once in a lifetime girl, so we want to support your venture up there! Can't wait to see you on TV"
"Woohoo! We're so excited for y'all! " "Hi friends and family! Jack is helping raise $$ for the Homewood marching band's Macy's Thanksgiving Parade 2018 trip. If you are so inclined, please follow this link to donate. Thank you!" "Congratulations to the HH Band! " "Go Patriots!! Dr. Vail & The Staff of Homewood Family & Cosmetic Dentistry are PROUD supporters!" "Proud alum here, Class of '79. Happy to support this great trip for the HHS Band! Would love to buy shirt, etc with the 40 year logo on it!"